Finally an affordable all grain starter kit. 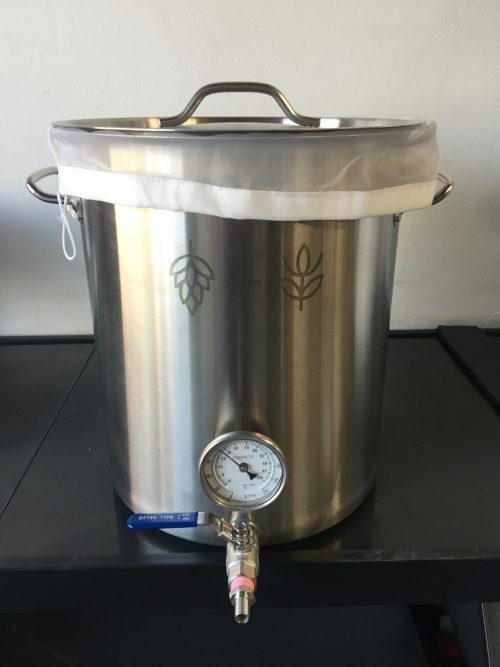 Brew in a Bag (or BIAB) is the cheapest and easiest way to get into all grain brewing (making beer completely from scratch like the pro’s). Note: Does not come with gas burner pictured unless purchased as an add-on. You can choose how you’d like to heat and cool the boil kettle. You may add a gas burner or weldless electric element (please contact us if you’d like the element installed for you – a charge of $20 and a lead time of 2-3 days applies), or you can keep it easy and cheap by heating the kettle on your own stove or gas BBQ. If you are unsure, we recommend the gas burner. Optionally, add a no-chill container, an immersion chiller or plate chiller. If you are unsure, we recommend the immersion chiller. Don’t forget you will also need your own fermentation equipment, and there is some assumed prior knowledge for brewing all grain. We assume you already know how to sanitise equipment, ferment beer and bottle or keg successfully. If you’ve never brewed before we recommend also grabbing one of our 23L starter kits as well, and follow the instructions and recipe included in that for a simple kit brew to gain confidence and familiarise yourself with fermentation, cleaning and bottling, before you do your first BIAB. We’re not able to provide phone/email support for your brewing process as the answers to all your questions exist online and we don’t google on customers behalf – like any hobby you need to do your own research, read-up and practise. That said, the included instructions and some common sense will serve you well.